1 of 4 Melt together chocolate pieces and milk in small saucepan over very low heat, stirring occasionally, until smooth, about 4 minutes. Remove from heat. Stir in 1 teaspoon of the vanilla until smooth. Pour the chocolate mixture into the prepared crust, spreading level. Refrigerate until chocolate is firm to the touch, about 1 hour. 2 of 4 Blend together Neufchatel cheese, confectioners sugar and remaining 1 teaspoon vanilla in medium-size bowl until smooth. Spread the cheese mixture evenly over the chocolate layer in the crust. Arrange strawberries on top, pointed ends up. 3 of 4 Melt the jam in a small skillet over low heat until smooth, stirring occasionally. Brush some of the melted jam evenly over the strawberries. Spoon on remaining jam to cover the cheese layer showing between the strawberries. 4 of 4 Cover the pie and refrigerate for 5 hours or up to 1 day. 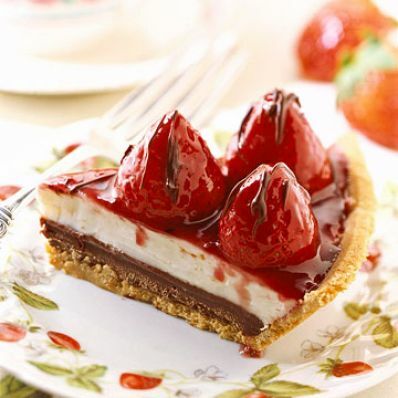 Cut into wedges and serve with whipped cream and drizzle with melted semisweet chocolate if desired. Per Serving: 26 g Fat, total, 52 g carb., 46 mg chol., 12 g sat. fat, 2 g fiber, 303 mg sodium, 7 g pro., 456 kcal cal.